One day, Jesus walked into a conversation his 12 followers were having about who would be the greatest in God’s kingdom. They were jockeying for positions of influence, but Jesus did not shame them. Instead, he challenged them to become like children, to eradicate their sinful tendencies, to seek the few who stray away, and to reconcile divisions between believers (Matthew 18:1-20). Our self-advancing flesh pressures us to excel and achieve notoriety. Our secular world entices us with positions of comfort, power, and entitlement expressed through grudge-holding, revenge, and retaliation. Is this true greatness? The issue with worldly greatness is a heart-posture, a lack of humility. Christlike greatness means making others’ needs a priority (Philippians 2:3, 4), becoming less in order to serve others more (Mark 10:44), and extending forgiveness (Ephesians 4:32; Colossians 3:13). Peter followed up Jesus’ challenge with the famous question, “Lord, how often will my brother sin against me, and I forgive him? As many as seven times?” (Matthew 18:21, English Standard Version). In ancient Judaism, two or three times was fair. Peter must have been thinking he was pretty great with his offer of “seven times.” Jesus responded, “Peter, your thinking is too small. Increase it 490 times!” In other words, there is no limit to forgiving one who wrongs you. To counter Peter’s high threshold of liberality, Jesus told a story about a king who began settling accounts with his servants (Matthew 18:23-35). These servants were more like representatives, one of whom amassed an enormous debt to the king. The amount this representative owed may have been more than the entire annual income of the king himself, even more than the coinage in circulation at the time. Some estimate his debt to be nearly 20 million dollars. (I imagine Jesus smirked a bit when he added that hyperbolic detail.) It would not take one, but 17 lifetimes for any minimum-wage worker to pay it off. The king decided to sell the representative and his family in an effort to recoup some of the debt. (Remember, this is a parable.) The representative fell to his knees and pleaded for patience so that he could work off his debt, which was patently impossible. But the king had compassion for this representative’s appeal and his mercy won out. Unexplainably, his majesty forgave the representative’s enormous debt. Now this is a great king! But the parable took a downturn: the forgiven representative did not reflect the character of his merciful king. Instead, he found another servant who owed him a meager three months of income. The representative, recently freed from 17 lifetimes of debt, mercilessly threw his fellow servant into jail over a 75 dollar debt. But Jesus’ point was not about paying off one’s debt. It revolved around the character of the king. He had gained great admiration with his subjects due to his benevolence. But once it was rumored that his representative was acting without mercy, it misrepresented the king’s own character. Jesus was saying if a human king could be that outrageously merciful, how much more will the King of Heaven extend unpayable mercy to us! When we are tempted with revenge and grudge-holding, God’s character is at stake. Jesus’ name is in the balance. It may seem unfair, but when we fail to forgive we fail to represent the King’s merciful heart. Of course we push back with, “What if I get hurt again?” True, giving someone a second chance is risky territory. It’s not easy to go from craving revenge to securing mercy for one who hurt us. Deep wounds are difficult to heal. If we‘re honest, sometimes we don’t want to forgive because we feel justified in our bitterness. That is when deliverance comes. Through Jesus’ presence (Matthew 18:20) we can address painful memories and emotional scars caused by another person. 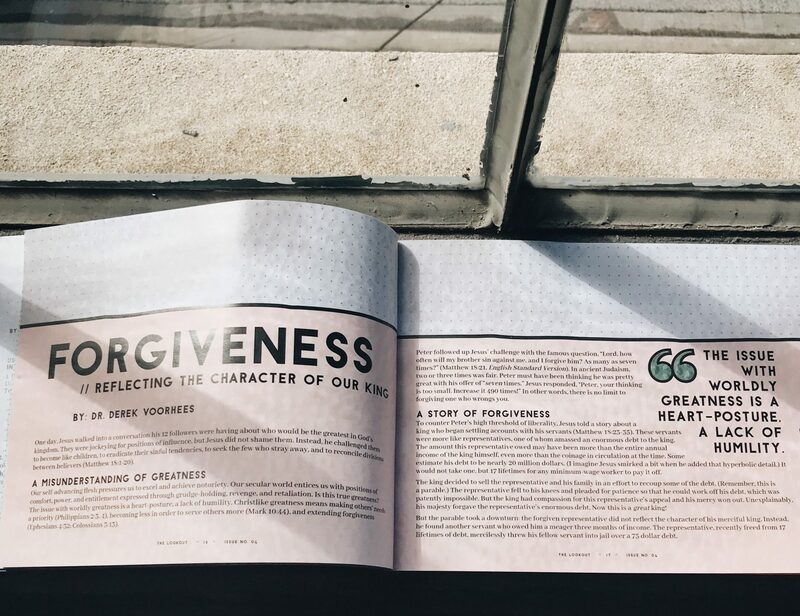 Author Christine Caine explains, “The blood of the cross doesn’t give us amnesia, but it does give us life beyond the past.” Embracing forgiveness for ourselves begins with being humble before God. First, we must recognize the suffocating burden of our sin debt and feel its weight. Then we must kneel before his majesty, humbly pleading for strength to change our sinful habits. He wants us to ask him to redeem our past and to release us from our unpayable debt (see Matthew 7:7; Philippians 4:6). Then we must hold tight to the fact that his merciful character ensures he will honor our request and give us what we need from him (see Psalm 84:11). Once we have accepted the King’s forgiveness we must overcome the temptation to withhold forgiveness; we must extend it to those who have wronged us. Anyone forgiven is a conduit of his mercy. To that end, we must continually let God’s mercy transform us to our core. Hesitancy to reconcile with our offenders reveals an ungrateful habit of the heart. There is no way to forgive like the King until we imitate his cruciform life. It does not feel good. It is excruciating. It stretches us. It humiliates us. But something good always comes out of carrying a cross. Christ’s cross becomes the optic through which we view others. The signature trademarks of Christ’s cruciform life are humility and compassion. We are truly great, most like King Jesus, when we extend mercy to someone who does not deserve it. Why? Because when we conform to Christ’s cross, we view offenders from a posture of humility. And we can forgive. Corrie Ten Boom and her family were Dutch Christians who witnessed the Nazis mistreating Jewish people during the Holocaust. So in 1943-44 they hid Jews in their home until they were discovered and moved to a concentration camp. There, Corrie grew angry at the German guards’ mistreatment of her sister Betsie. In the years following the war Corrie returned to Germany. Here in her own words is what happened on one occasion. And I could not. I remembered the suffering of my dying sister through him. But when I saw that I could not forgive, suddenly I knew: I myself, have no forgiveness! . . . I was not able. I could not! I could only hate him! . . . And I said, “Thank you, Jesus, that you have brought into my heart God’s love through the Holy Spirit which is given to me. And thank you, Father, that your love is stronger than my hatred and forgiveness!” That same moment I was free and I could say, “Brother, give me your hand.” And I shook hands with him. It was as if I felt God’s love stream through my arms. You never touched so (much) the ocean of God’s love as when you forgive your enemies. Can you forgive? No, I can’t either—but he can. Dr. Derek Voorhees serves as president at Boise Bible College, Boise, Idaho.